Overreader: Hug on your babies! So in case I don't get sentimental enough around the holidays (ask K how much I cried during the half of It's a Wonderful Life we caught post-Thanksgiving) - I always like to delve into a few books that have high potential to make me maudlin. This season: kids without parents! 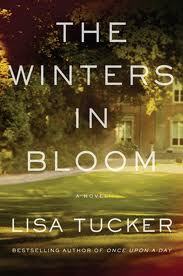 I've been a fan of Lisa Tucker's since her debut, The Song Reader. (My review of it never ran, but it was my first assignment for People, back when I wrote for them.) Her newest is The Winters in Bloom, and, yep, I still love her elegant and lyrical prose, and admire her insight into people. This one is about Kyra and David Winters, a pair of damaged individuals who think they've found that building a life together will allow them to let the sleeping dogs of their pasts lie. But it's a lie, and when their five-year-old, Michael, is kidnapped from their yard, they find themselves separately slammed into the realities of all they'd hoped to leave behind. Michael proceeds through his own dream-reality of the first hours away from his hovering, overprotective parents. Tucker gives his consciousness a chance to grow and observe in a very organic way that feels right for Michael's age. I was listening to Xe Sands's narration of The Sweet Relief of Missing Children by Sarah Braunstein, while reading Tucker's novel, which added a layer to Michael Winter's experiences with his kidnapper. Not that Braunstein didn't include plenty of layers of her own for me to ponder. (Sands is another of those narrators I can listen to read just about anything, and her handling of the voices and tone of Missing Children really wowed me.) This is one of those well-constructed symphonies of a book - each storyline trading off and sometimes vying for prominence but all ultimately working together towards a common tune. In this case, the tune is missing children. 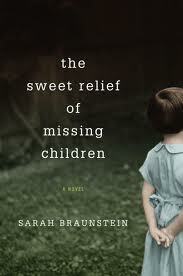 Children who were taken, or who have run. Children who long for escape, and some who find it. Children who find that escape isn't all that escapist. It's powerful stuff, and Braunstein handles it deftly. Some POV is from the children, some from the adults, and not every adult or even every child is sympathetic. I'm torn between giving my kids a lecture on stranger danger and interrogating them about their innermost thoughts in order to somehow magically ensure that nothing Braunstein wrote in her debut could ever, in my world, be true. 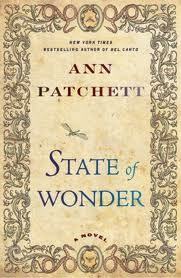 Ann Patchett's State of Wonder (which I started out reading but had to return to the library, and finished up by listening to as read by the engaging Hope Davis) is - well, wonderful. One of my top ten of the year. (And it looks like I'll end the year at about 300 books, so that's a pretty tight percentage there.) Patchett is another author I'm always excited to see on the new titles lists - I presume every one of you has read Bel Canto already, right? If not, go away and get it immediately. Now! Go! Okay, so this one moves between Minnesotan research labs and the Brazilian rain forest, as Dr. Marina Singh fulfills a promise to the widow of her research partner, Dr. Anders Eckman. Anders died while chasing up the elusive Dr. Anneck Swenson, who had been Marina's inattentive but brilliant mentor in med school. Anneck does her best to stay elusive while Marina, who already has a bit of an identity push-pull thanks to her Minnesota-India heritage, finds unimagined facets of herself in the Amazon. Meanwhile she struggles with her obligation to Anders's widow and his three sons, to find out what really happened to him, and the purview from her boss to examine the state of Anneck's research, not to mention Marina's memories of the incident that drove her to leave medicine for research. The drugs being developed could enormously enlarge a woman's window for pregnancy, which niggles at the mind of forty-ish, single, childless workaholic Marina. It's all a rainbow of imagination-stretching elements, and in Marina, Patchett has created a prism through which to refract it back at the reader. Heady, engrossing, thoughtful stuff. Also, there were those three fatherless boys, and the orphan child Marina befriends in Brazil, plus the losses and near-losses in the other books. So what I'm getting at here is, oh, I'm so glad I haven't lost my babies, or been lost to them. And hey, kids, you can laugh at the way holiday movies make me cry any old time.